Yes. Children 5 to 11 years old are 50% of the adult price. Children 4 and under are free, but are counted for seating. Do you provide rental items such as linens, silverware, glassware, tables, and chairs? Yes. When we are booked to cater your wedding, if the venue is not providing them, we will coordinate all of the rentals under our scope of responsibilities, such as tables, chairs, linens, dishware, glassware, and silverware. We also have access to fine china, crystal, lounge furniture, pipe & drape, and specialty linens. We can also arrange for larger items such as canopies, stages and dance floors. We do not allow our clients to coordinate their rentals themselves. Our professional reputation depends on the success of a professionally and flawlessly executed event, from the dance floor down to the last dessert fork. La Mediterranee will work with a third party alcohol vendor if you would like us to provide the alcohol. We do not have a liquor license (for hard alcohol), but we do have a caterers license to serve wine and beer. We also maintain the necessary liability insurance to serve your guests if you provide the alcohol. For our service only package, we will also include bar setup, ice, and a selection of non alcoholic drinks for your guests, if you would like. Yes, we are a ‘full service’ caterer. Do you have a corkage fee if we supply the beverages? Yes, we offer a per person “Service Only” Package for providing service, while you provide the beverages. This moderate beverage coordination fee covers the use of our insurance and licensing, as well as basic equipment. As customary with many other catering services, we charge a modest cake cutting fee of $1.50/person. We will dress and set the tables, clear the tables, and clean the service/kitchen area, leaving it as we have found it. If you wish us to set up and breakdown the tables and chairs, this will increase the overall labor cost. As a general rule, we provide one server for every 25 people at a buffet. We provide one server for every twenty people at a sit down dinner. However, the server ratio depends on how formal or complicated the event is and may be reduced or increased, depending on these factors. Using your event details, we will recommend the minimum number of servers required based on our experience. Our goal is to make your event run smoothly. Besides the cost for food, what other charges can I expect for a catered event? The service charge offsets labor and administration costs such as dishwashing, packing for your event, travel time to and from your event, site visits, rental negotiations and purchasing, etc. The service charge is not a gratuity and is subject to state and local tax laws. Will you act as my wedding planner? We do not provide wedding planning or coordinating services. If you book with us, we are happy to provide you with our list of preferred coordinators. We do require that in booking with La Med, you agree to hire (at minimum) a professional day of coordinator (of your choosing), whom you will contract on your own. This coordinator will assist in taking care of details outside of the scope of catering, such as Timelines, Guest counts, Floorplans, Decorations, Travel, Parking, Security, Venue Contracts, Insurance, Gifts, Lighting, and Coordinating with other Vendors (DJ, flowers, photographer, officiant, etc). Our sales and management team will work closely with your wedding coordinator to ensure a smooth and professional execution of your special day. Based on our years of experience in the wedding industry, combining our expertise with the professionalism expected from your wedding planner or coordinator are the keys to a successful wedding day team! Our ability to provide exceptional and amazing service to you relies on creating and executing a plan which combines those elements under the larger event scope with those under the catering (reception) scope. As members of the Weddings Industry Professional Association, we highly recommend booking someone who comes with experience and references, so that we can finalize all of the vital details well in advance of the big day, so that everything runs perfectly! Will you have a manager on site? Yes, we always book a Catering manager to oversee the execution of your wedding day service. Our managers have years of experience and their primary role is to ensure that every detail is executed to plan according to the timeline and vision that you and your coordinator have created. The manager acts as the team lead to manage the onsite cooks, servers, and bartenders and will be the point of contact throughout the day with you & your coordinator. We are committed to ensuring that the timing of the service, as well as all details under our scope (food, beverage, dishware rentals, linens, drinks, dessert, setup and breakdown) are in our professional & capable hands. 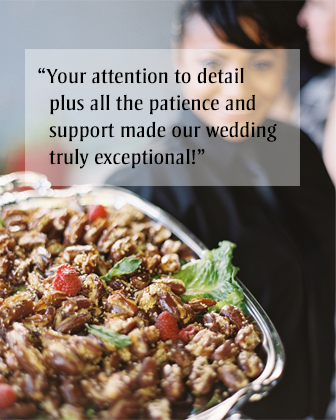 On the day of the wedding, your coordinator oversees all of the bridal party and planning elements to ensure your ceremonies run smoothly, and the catering manager oversees all aspects of the reception catering service. We include a suggested gratuity on the proposal and invoice – however, it is ultimately up to you if you choose to tip, and how much! It is always appreciated by our staff for a job well done. We also share the gratuity between our kitchen and serving staff. You can choose to leave this gratuity at the conclusion of your event. What is “drop off” service? We bring a buffet to you, set it up and return later to pick up any non-disposable rental items (if they are rented at an additional cost) . There are no servers. A delivery & pick-up fee is included in the rental charge. This option works best for informal corporate events and informal parties of less than 30 people. Do you provide paper goods, china, linens, or chaffing dishes for drop offs? For drop offs, we offer quality paper plates and compostable plastic eating utensils for a small fee. At an extra rental fee, we can also provide a linen for the buffet and will set up any necessary chaffing dishes. If you prefer china and silverware, if given advanced notice, we can make arrangements for a rental order, and charge our 15% coordination fee on top of the cost of the rental. If it is short notice, we will be happy to recommend you to a third party rental company who can assist you with this order. Yes, we have a basic price list, which applies to most of our corporate menus and medium sized events. However, most of our larger event menus are custom designed for a specific event and a particular client. After a brief conversation with an event coordinator, we will prepare a personalized proposal for your budget. The factors that affect the price of an event include the number and kind of menu choices, number of guests, length of the event as well as number of servers required. We try our best to accommodate your budget. Our goal is to give you the fairest price based on your specific needs. We charge for our staff by the hour, based on a five hour minimum per staff person. We build our proposals as an estimate based on the event location, duration, guest count, labor needs, guest to server ratio for the style of service (plated versus buffet versus passed appetizers, etc), timeline, rental setup or breakdown, etc.. The final cost is based on the actual time worked. For large full service events (such as weddings), we require an Event Manager to oversee staff and ensure the coordination of a successful event.